Vladimir Putin's spokesman again denied Russia meddled in the 2016 election. The Kremlin has responded cautiously to the conclusion of special counsel Robert Mueller’s investigation that found no evidence of a conspiracy by Donald Trump's presidential campaign to help Russia interfere in the 2016 U.S. election. Russian President Vladimir Putin’s spokesman Dmitry Peskov told reporters on Monday he couldn't comment on Mueller's findings since no one had seen the report in full, and he denied again that Russia had meddled in 2016. "We haven’t seen the report itself," Peskov said in a daily briefing call with reporters. "We have seen a certain condensed version, a summary, which, moreover, tells nothing new, except the acknowledgment of the absence of any conspiracy." Reiterating Russia's long-standing blanket denial that it had interfered in the 2016 election, Peskov said of Mueller's investigation, "It's hard to find a black cat in a dark room, especially if it's not there." Attorney General William Barr on Sunday released a summary of the key findings of Mueller’s 22-month investigation into Russia's effort to influence the 2016 election. In a letter to Congress, Barr quoted from Mueller's own report that the special counsel had found no evidence that Trump or anyone associated with his campaign had conspired with Russia, "despite multiple offers from Russian-affiliated individuals to assist the Trump campaign." Peskov denied that Russia had sought to aid Trump or meddled in 2016 in any way. He also rejected Mueller's finding that Moscow mounted a two-pronged influence operation targeting American social media and a hacking attack that stole and then leaked documents from the Democratic candidate Hillary Clinton's campaign. Other Russian officials' reactions were far more strident, however. Russia's foreign ministry criticized Mueller’s investigation in a Monday statement as a waste of time and resources, and said the accusation of Russian meddling was an "obvious fake." "The long-awaited Mueller report has proved what we in Russia knew from the very beginning: there was no conspiracy between Trump and someone from his team with the Kremlin," Kostantin Kosachev, a prominent senator who chairs Russia's senate committee on foreign affairs, wrote on his Facebook page, condemning what he said had been "two years of ceaseless lies." Meanwhile, anchors on the main state news channel, Russia 24, mocked how much time and space American media had given to what they called a "fake." 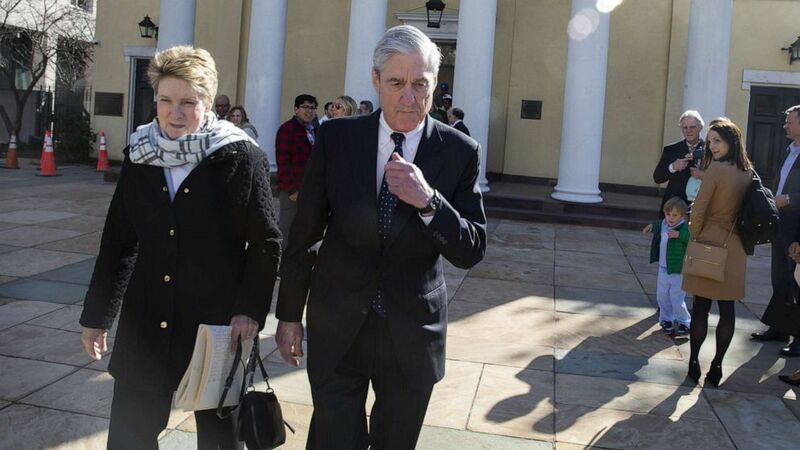 (Tasos Katopodis/Getty Images) Special counsel Robert Mueller walks with his wife Ann Mueller, March 24, 2019, in Washington, D.C. Mueller has delivered his report on alleged Russian meddling in the 2016 presidential election to Attorney General William Barr. Mueller’s investigation saw 34 people charged, among them six Trump aides and advisers. Twenty-five Russians, many of them military intelligence officers, were indicted for their role in the hack of Democratic party institutions, or for taking part in the social media campaign. In those indictments, Mueller laid out how the Russia’s intelligence services and a so-called "troll factory" in Saint Petersburg had sought to influence the U.S. electorate. Russian officials and state media for two years have insisted the accusations of election meddling are fantasies invented by the Democrats to be used as a pretext to sanction Moscow. Despite Barr's letter stating the opposite, Russian officials on Monday portrayed Trump's clearing of collusion as also proving there had been no Russian interference of any kind. The Russian foreign ministry on Monday attacked the Obama administration, accusing it of trying "to discredit Trump" in 2016 by making "unfounded accusations of 'hacking attacks.'" The Obama administration in 2016 agonized over how to make Russia's election operations public, worrying over just such an accusation of partisan bias, former administration officials have since said. After Republican leaders rejected a request to make a partisan statement calling out the Russian campaign, in the end, the Department of Homeland Security and the Office of the Director of National intelligence released a joint statement in October 2016 noting the Russian efforts, but leaving out whether the Russians had sought to help a particular candidate. With Mueller's investigation now over, some Russian senators said they hoped Trump might now try to improve relations with Russia, but they expressed doubts, saying they feared instead fresh sanctions were more likely to follow. "We in Russia have little to celebrate," Kosachev wrote, saying he believed Congress would now argue that even without a conspiracy it was necessary to strengthen sanctions against Russia. "There is a chance to reset much in our relations, but whether Trump will risk it remains an open question. We, obviously, are ready," Kosachev wrote, adding Trump should use the moment to begin negotiations on two key arms agreements, the Intermediate-range Nuclear Forces and the START treaties. Russia and the U.S. in any case are at loggerheads in many areas unrelated to the 2016 election-- from Syria to Venezuela.Maria Lipman, a veteran Russian journalist and editor of the Counterpoint journal, agreed it was unlikely that Mueller's conclusion would ease the confrontation. Having used Russia as "a battering ram against Trump" for the past two years, she said, it would be hard for Democrats to now put it aside and that the portrayal of one another in both countries was so negative that little could change in the short term. "The antagonism between Russia and the U.S. has become so deep that I don't think there can be any improvement. I don't think we should expect any change," she said.